1Faculty of Management, Payam Noor University, Tehran, Iran; 2Faculty of Economics & Administrative Sciences, Ferdowsi University, Mashhad, Iran. Copyright © 2013 Seyed Mehdi Mousavi Davoudi, Meysam Allahyari. This is an open access article distributed under the Creative Commons Attribution License, which permits unrestricted use, distribution, and reproduction in any medium, provided the original work is properly cited. The current study was conducted in Mazandaran, a northern province of Iran, and aimed to analyze the effect of job organization on job performance of 1000 operating staffs in 50 manufacturing companies. According to Krejcie & Morgan table , the minimum number of sample size was determined as 278 people. A total of 333 questionnaires were distributed among respondents and 284 usable questionnaires were returned. The research method used for this study is descriptive-correlation. 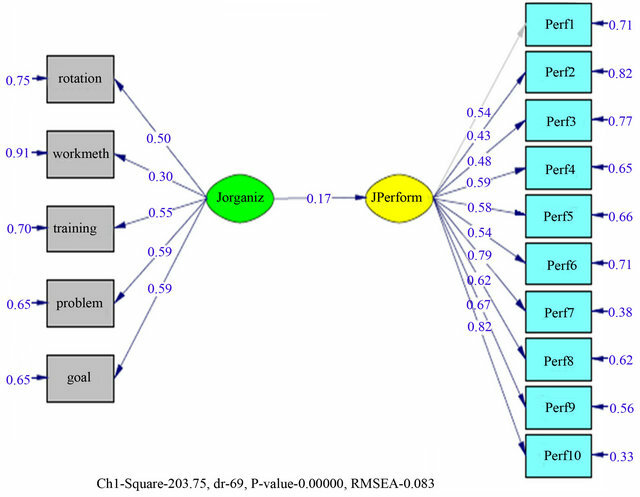 Further, the analysis was carried out utilizing Structural Equation Modeling (SEM) methodology by LISREL 8.8 software. The factors analysis and the findings show that job organization has a significant positive influence on job performance. Further, a number of suggestions on managerial implementation were proposed. In today’s uncertain environment, any organization should try to apply its resources correctly to achieve competitive advantages. It has been said that the most important assets of any business walk out the door at the end of each day . Taking into account the increasing competition, fast-paced technological change, globalization, and other factors, businesses are seeking to understand how one of the last truly competitive resources, their human resources, can be managed for competitive advantage  and for achieving organizational superior performance . Past studies have revealed strong linkage between employees’ performance and organizational performance. Further, it has been established that satisfied employees show higher performance than others. Consequently, employees satisfaction leads to delivering better goods and services to customers  which contributes to achieving customers loyalty; and having a loyal base of satisfied customers within such a competitive environment, increases revenues, decreases costs and builds market share . Various factors influence employees’ satisfaction; in this paper, the author focused on job design and job organization. Despite the growing literature on job organization and job performance, the author couldn’t find any research exploring the link between these two variables. Therefore, the present paper tries to propose a framework on the mentioned topic in Iran. The main aim of job organization is to reduce job dissatisfaction and alienation of employees emerging from repetitive duties. Through job organization, organizations try to increase productivity levels of employees by enhancing their responsibility and creating a sense of personal achievement. In this study, five job organization factors were tested  as follows: job rotation, work method, training, problem solving and goal setting. Job rotation is an approach that employees are shifted between two jobs and it is a practice that reduces employees’ boredom of doing a particular job every day and gives them a wider experience and more insights in different fields of operations. Work method refers to procedures that one job can be done. In order to provide suitable work method, managers will ask employees to choose the way of doing their jobs based on their own ideas. Training is the acquisition of skills and knowledge as a consequence of teaching work related competencies. Training has specific aims such as improving employees’ capability and performance. Problem solving refers to methods used by managers for finding and solving work related problems for employees . Goal setting involves determining specific, achievable and time targeted goals. It ensures employees that they are making progress by establishing what is expected from them. Job performance of employees is an important issue for any organization and refers to whether an employee does his job well or not. Job performance consists of behaviors that employees do in their jobs that are relevant to the goals of the organization . In this study, for measuring employees’ job performance, they were asked whether they try their best to achieve predetermined objectives of their jobs. As can be inferred from the definitions of five dimensions of Job Organization, the main aims of job rotation, work method, training, problem solving and goal setting are improving employees’ satisfaction, skills and knowledge. Based on previous studies, satisfied employees will work with better mood and will learn more skills . Moreover improving employees’ skills and knowledge, contributes to improving their capacity in accomplishing job activities. Finally, Satisfied and skilled employees will show higher performance in their job . H: Job organization has a significant positive influence on job performance. Statistical population of this study includes 1000 operating staffs of 50 manufacturing companies in Iran. The author used systematic random sampling for gathering data. According to Krejcie & Morgan table , the minimum number of sample size was determined as 278 people. The author sorted employees in an alphabetically sequence, and every 3rd employee has chosen as statisticcal sample of this study. A total of 333 questionnaires were distributed among respondents and 284 usable questionnaires were returned. Table 1 illustrates the descriptive statistics of the respondents. Table 1. Description of the respondents. The authors used 20 items for measuring five dimensions of job organization; and 10 items for measuring job performance. Moreover, we used a five-point Likert type scale for all the items. Response categories range from 1 (strongly disagree) to 5 (strongly agree). The summary statistics of formal survey are shown in Table 2. For reliability evaluation the authors utilized Cronbach’s alpha. The Cronbach’s alpha reliability of all the variables were more than 0.7 (α > 0.7), which indicates that all scales demonstrated good reliability. In the initial step, the author applied confirmatory factor analysis in LISREL 8.8 and eventually conducted path diagram of X model. The author tested the relationship between job organization latent variables and its indicators. In the next step, the author adopted confirmatory factor analysis for job performance and its indicators and eventually conducted path diagram of Y model. Fitness’s indices in Table 3 show good fitness of both X and Y models, proving that the selected indicators are good representatives for each dimension of job organization and each question of job performance; which indicate that all scales demonstrated good validity. Further, measurement model of the X model provides the factor loading of each dimension of job organization. These factor loadings illustrate the importance of each dimension for respondents. The ranking of dimensions is shown in Table 4. In this study, the relationship between job organization and job performance was tested using the SEM technique. For testing the hypothesis, the author performed structural model applying five dimensions of job organization and ten questions of job performance. Figure 1 shows the results of the SEM analysis. Fitness’s indices also show good fitness of the structural model (Table 5). Figure 1 shows the relationship of research variables. Based on the results of SEM analysis, research hypothesis is confirmed. Table 6 summarizes the hypothesis test results in terms of path coefficients (standardized) and t-value as follows. Table 2. Summery statistics of survey. Table 3. Fitness indices of X & Y models. Table 4. Factor loadings of job organization dimensions. Table 5. The structural model fitness indices. Table 6. The results of the hypothesis test. The aim of the present study is to investigate the relationship between job organization and job performance. The factors analysis and the findings show that job organization has a significant positive impact on job performance of operating staffs. The findings of the current study imply that appropriate job organizations, based on employees’ ideals, leads to higher performance of them. Taking into account the results of the subsidiary hypotheses hidden in the job organization model, “goal setting” and “training” have the most significant relationship with an appropriate job organization. Thus, managers and business owners should establish specific, measurable, achievable, realistic and time-targeted goals for their operating staffs, as having the largest proportion in most of the manufacturing companies. Further, goal setting theory suggests that to achieve competitive advantages through employees, participants in a group should clearly be aware of what is expected from them. Moreover, training is another important factor defined as acquisition of skills, knowledge, and competencies as a result of the teaching of vocational or practical skills; which needs to be understood by managers, especially HR managers, whose duty is to provide appropriate training programs to improve staffs’ capability, and capacity. Furthermore, taking into account the structural equation model, goal setting and problem solving have the greatest impact on staffs’ performance. Problem solving refers to a state of desire for reaching a definite goal from a present condition that either is not directly moving toward the goal . Therefore, managers should implement some strategies to distinguish and solve problems in time. Figure 1. Structural equation model. ganizational citizenship behavior, organizational structure and etc. as mediating variables. Further, Present study was based on a survey and it captures a situation or an event at a point in time. Future research could employ a more qualitative approach, such as longitudinal study. R. V. Krejcie and D. W. Morgan, “Determining Sample Size for Research Activities,” Educational and Psychological Measurement, Vol. 30, 1970, pp. 607-610. P. Boxall, J. Purcell and P. Wright, “The Oxford Handbook of Human Resource Management,” Oxford University Press, Oxford, 2007. S. M. M. Davoudi and R. Kaur, “The Link between Internal Marketing and Human Resource Management,” Arth Prabhand: A Journal of Economics & Management, Vol. 1, No. 2, 2012, pp. 59-72. H. Nadiri and C. Tanova, “An Investigation of the Role of Justice in Turnover Intentions, Job Satisfaction, and Organizational Citizenship Behavior in Hospitality Industry,” International Journal of Hospitality Management, Vol. 29, No. 1, 2010, pp. 33-41. J. P. Campbell, R. A. McCloy, S. H. Oppler and C. E. Sagger, “A Theory of Performance,” In: N. Schmit and W. C. Borman, Eds., Personal Selection in Organizations, Jossey-Bass, San Francisco, 1993, pp. 35-70.